What’s inside the earth? What’s the weather today? What’s the big deal about the oceans? What’s going on with the sun and the moon? God created it all. There are four basic areas of Earth science: geology, meteorology, oceanography, and astronomy. Geology is the primary Earth science. It deals with the composition of Earth’s interior and its surface. Meteorology is the study of the atmosphere and how processes in the atmosphere determine Earth’s weather and climate. Oceanography is the study of Earth’s oceans, which covers about 70% of our planet. Astronomy is the study of the universe and our solar system. In this full year (30 week) Earth Science course, we will explore all 4 aspects of Earth Science. We will understand how Earth’s processes have a significant impact on our lives. 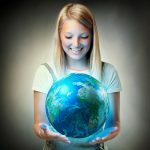 Why on Earth should we care about our Earth? Get ready to enjoy virtual labs, web quests, and hands-on experiments. An eBook will be provided.